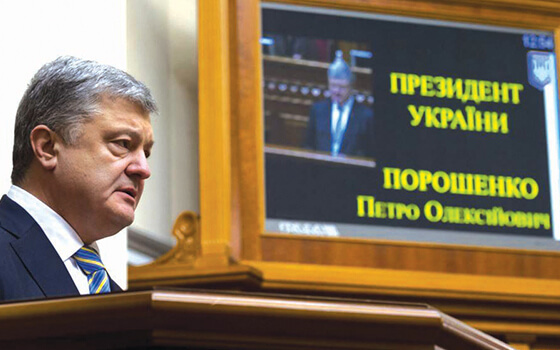 Ukrainian President Petro Poroshenko addresses the country’s parliament on February 19. In a move certain to increase tensions with Russia, Ukrainian president Petro Poroshenko signed a constitutional amendment earlier this year to join NATO and the European Union. While admitting that his country still had a long way to go to meet membership criteria, Mr. Poroshenko told the Ukrainian parliament that securing Ukraine’s membership in these Western organizations was his “strategic mission.” While the March 31 Ukrainian presidential election had not been held as this issue of Good News Report went to press, Mr. Poroshenko said his plan was to make a formal bid to join the EU by 2023 and to negotiate an action plan to join NATO. You may make this donation with confidence that your transaction is encrypted and secure. Is this donation In Honor or In Memory of someone? Title Mr. Mrs. Mr. and Mrs. Miss Ms. Dr. Dr. and Mrs. Thank you for your gift of ! Your first gift to SGA is a blessing, and we thank you for helping to transform the lives of Russian-speaking orphans by providing a Bible, food, clothing, and weekly discipleship visits for six months. Through your generosity know that God is using you to help orphans start new lives as their hearts are won for Christ. Would you like to add an extra comment? Russia has long opposed former Soviet nations making moves toward NATO, viewing it as a threat to national security, and this has also led to increased tensions with the West. The conflict in eastern Ukraine with Russia-backed separatists—in addition to Russia’s annexation of Crimea—has further stoked these tensions. Please pray for evangelical churches in Ukraine as they proclaim the peace of Christ and help families who have been devastated by the conflict.